Life has been hectic since the last post. And it bothers me that I have left this so long with no updates. I will try to do better in the future. We haven’t been flying much for one reason or another. The first reason is Hurricane Irene. She may have only been a category 1 storm when she passed over our heads but the rains and winds were enough to disrupt our lives significantly. We were lucky in that we had no damage to our property. Although we did have to have three trees taken done to avoid later possible damage. Needless to say, the regular weekly kite fly was canceled. Right after the clean-up was completed at both houses, it was time to pack up the car and leave for the Mile High Kite Fly at Beech Mountain, NC. This festival was so named because Beech Mountain is 5,506 feet above sea level, the highest town in the state. Saturday is set-up day and a kite builders competition. 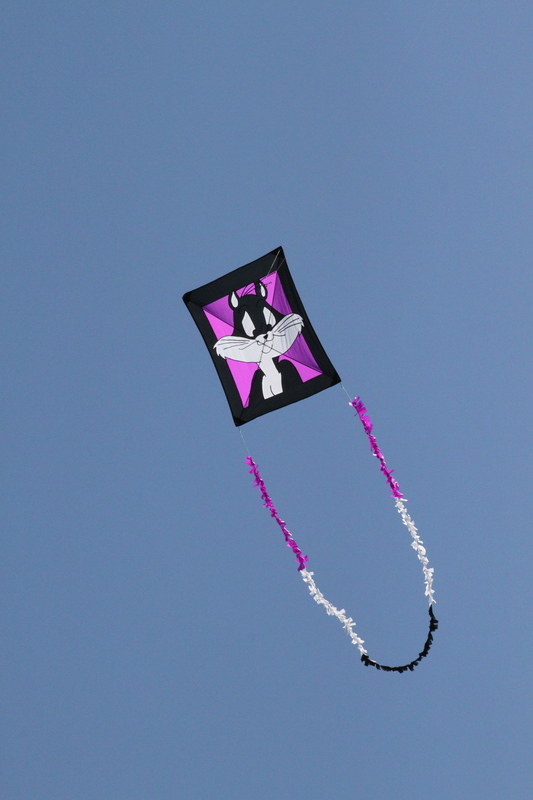 I decided to take the plunge and enter some of the kites I had built. 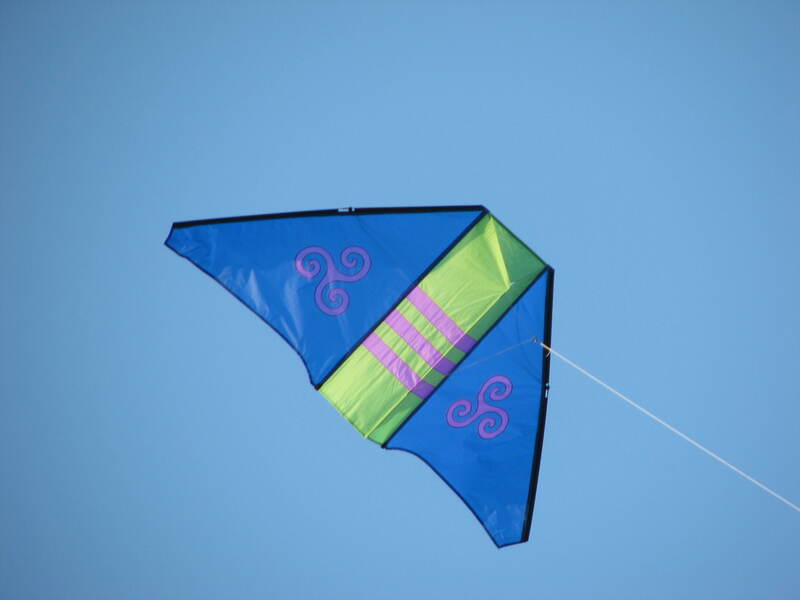 Hopefully, the judges would be kind and I would pick up some pointers on kite building and competing. I spent a couple of hours Saturday morning attending to details on my kites and getting very nervous about the competition. The judging is done in two stages: in the air ( how will it flies and looks in the sky) and on the ground (how well it is made). I entered four kites in three categories. In the flat & bowed kites, I entered the Penelope Cat della porta and the Green Bay hata. 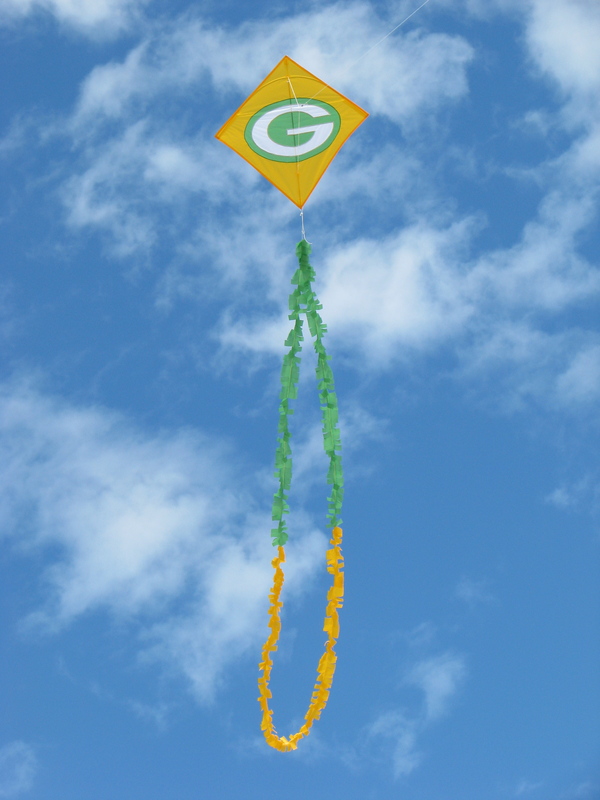 (Side note on the hata – I finished this kite and flew it for the first time on Superbowl Sunday. Need I mention who won Superbowl LXV? Go Packers!!) In the soft & flexible, I entered the Eagle painless parafoil. In the box & cellular, I entered the Dunston-Taylor box delta that I had finished the night before leaving for the festival. The winds on Saturday were light and variable and the skies were cloudy. Not the best day to show off one’s handiwork. But we do the best we can with what we’ve got. There were a total of none kites entered in the competition. They all flew to one degree or another. I had the hardest time getting the parafoil to fly but once it got up, it flew steady like a champ. There wasn’t quite enough wind for the flat & bowed so it took some work to keep them in the air high enough for the judges to see what they looked like. But we managed. 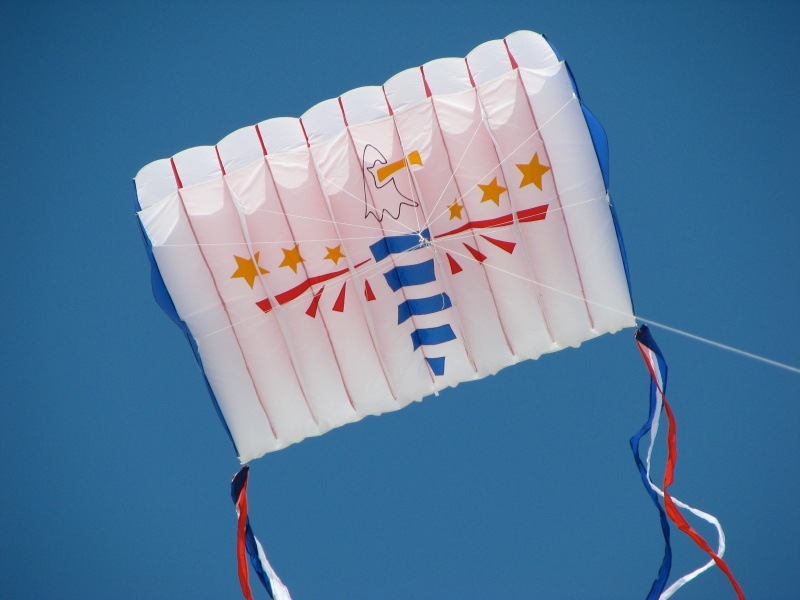 The Dunston-Taylor box is a light wind kite so there was no problem there. The judges’ scores were tallied but the results weren’t going to be announced until the next day. More nervous waiting. I did get some great comments from the judges and a lot of good advice and suggestions. Lots of encouragement to keep on building. And have to admit, it was fun and I look forward to doing it again. Sunday was the festival day. The day full of flying and kid’s kite-making and kid’s flying up and down the mountainside. But there was no wind. Yes, even less than the day before. But that didn’t seemed to stop the kids. They ran up and down and up and down trying to get their kites in the air. Some brought their own kites to fly and some bought kites from a vendor on site. The clouds became thicker and darker and around one o’clock the skies opened and the rain came down. We were ready to wait it out until there was thunder and lightning. Then the tents came down and the banners were put away and the festival was officially over. It all ended too soon. There was a fliers cook-out later that evening despite the rain. Thank goodness for picnic shelters. At the cook-out, the winners of the kite builders were announced. I was truly surprised when I found out I won first place in soft & flexible with my Eagle parafoil. I truly thought my competitor’s kite was better but the judges thought otherwise. Hurray for me!!!!! Then I won a second place in flat & bowed with the Penelope Cat della porta. A second Hurray!!! Two awards in my first competition. Pretty good. I’ve started planning for next year.